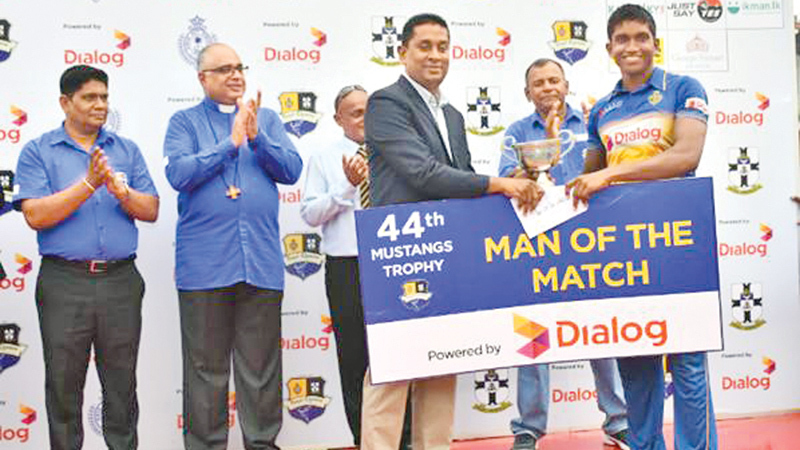 Lahiru Madushanka of Royal College, Colombo, receiving the Man of the Match trophy from Chirantha De Zoysa, SGM and Head of Dialog Television. V S Gunathilake, Senior Deputy Principal, Royal College, Rev. Marc Billimoria - Warden, S. Thomas’ College, Mt. Lavinia, (partially covered) Gamini Perera – Chief Guest (Royal College Captain - 1993) and S. Rajmohan, Co-Chair, Royal – Thomian Match Organising Committee are also present. Royal beat S. Thomas by one wicket.